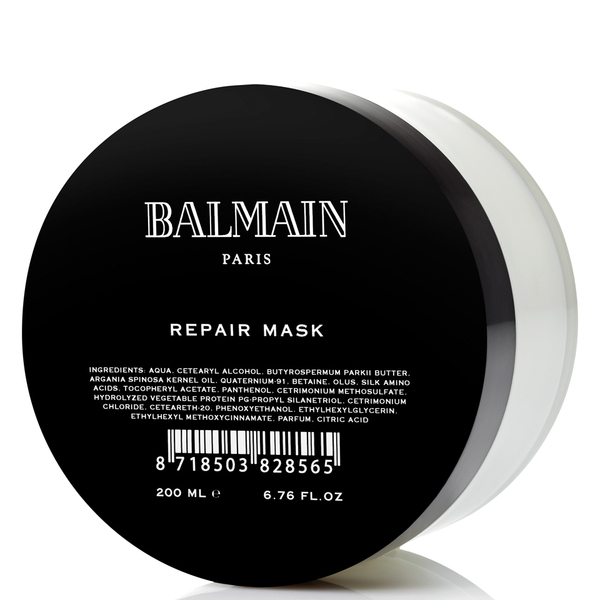 Treat damaged, over-processed hair to the Balmain Hair Moisturising Repair Mask; an intensive treatment developed to repair, restore and revitalise locks from root to tip. Harnessing the regenerating powers of pure organic Argan Oil and Pro-Vitamin B5, the replenishing mask works to nourish, soothe and calm sensitive scalps, whilst UV shields protect from environmental aggressors to reveal soft, manageable locks with enhanced shine. Suitable for natural or colour treated styles, it stimulates hair growth for a thicker, fuller appearance. Apply to towel-dry hair; massage softly and rinse thoroughly after 5-10 minutes. Use the Repair Mask once a week to get the best result. Aqua, Cetearyl Alcohol, Glycerin, Argania Spinosa Kernel Oil, PPG-3 Myristyl Ether, Isopropyl Myristate, Amodimethicone/Morpholinomethyl -Silsesquioxane -Co-polymer, Quaternium-91, Butyrospermum Parkii Butter, Trimethylsiloxyphenyl Dime-thi-cone, Betaine, Cetrimonium Methosulfate, Trideceth-5, Silk Amino Acids,-Toco--phe-rylAcetate, Panthenol, Ceteareth-20, Cetrimonium Chloride, Hydrolyzed -Vegetable Protein PG-propyl Silanetriol, Polyquaternium-53, Ethylhexyl Methoxy-cinnamate, Hydroxyethylcellulose, Polyquaternium-10, Parfum, Phenoxyethanol, Ethylhexylglycerin, Disodium EDTA, Potassium Sorbate, Lactic Acid.